Mount Kinabalu rises from the Kinabalu National Park. At an impressive 13,500-foot (4,101m), it's one of the highest peaks in Southeast Asia. It's a relatively easy climb, though, with tourists of varying ages and fitness levels enjoying the two-to-three-day ascent. Most people spend a night at Laban Rata before mounting the summit. Along with being the name of a resthouse that caters for hikers, Laban Rata is the name most people use for the area. The summit is a three-to-four-hour hike away from the hostel. Hikers should leave between 2am and 3am if they want to catch one of the area's magical sunrises. Visitors will encounter some weird and wonderful vegetation as the scale the jungle route, and can expect some astounding views from the top. Hikers should note that while the climb doesn't require any special equipment or technical skills, some people may experience the dizziness and shortness of breath associated with altitude sickness. 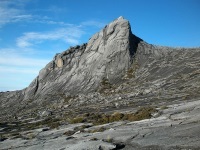 All in all, climbing Mount Kinabalu is an extremely rewarding adventure and one of the top activities in Malaysia.